What Caused Inequality to Grow? It is a commonplace that since the 1970s, inequality in America has been growing rapidly--far more rapidly than our peers abroad. Naturally, this has invited a lot of attempts to explain that growth, usually in terms of America's tax policy, its culture, or some sort of capture of our national institutions by the rich, allowing them to rig everything in their favor. But Scott Winship offers an intriguing alternative possibility--is our outsized growth rate an artifact of mid-eighties changes to our tax code? Wow, that's a four percentage point increase in two years--three times the increase over the 16 years from 1970 to 1986, and bigger than the 12-year increase from 1988 to 2000. Huh. There are two possibilities here. One is that the data is right. You can see where I'm going here. Winship shows that if he adjusts that anomalous 1986-88 growth rate to the level that prevailed in other countries, the trend in our inequality growth looks about the same. As Winship points out, this doesn't mean that US income inequality isn't higher than that in other countries (though it does illustrate how hard it is to calculate). 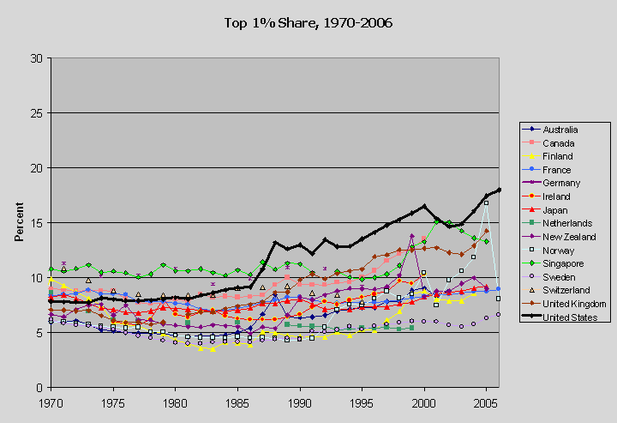 But if the trend isn't very different, than that changes how we explain inequality here. Explanations involving very US-specific factors, like "culture", our tax policy, or some sort of capture whereby the wealthy have somehow rigged the system in their favor, become much less compelling. Rising inequality (and slower income growth) have been a rising trend across most of the developed world for three decades. We need a better explanation than greedier rich people, or stupider politicians.